The Libraries, in cooperation with Catholic Educational Association of the Philippines (CEAP), and in partnership with Green Giant FM, ARCHers Network and The La Sallian, held its fifth non-thematic human library last 30 June 2016 at the Exhibit Area, The Learning Commons, 6th floor Henry Sy Sr. Hall. Dr. Elenetia D. Garcia, Full Professor, Department of Philosophy gave the opening remarks. On her response, Sr. M. Roselita T. Geronimo expressed her appreciation of the Human Library session as a venue to discuss prejudices and stereotypes. Dr. Dorothy P. Javier, Assistant Professor from Theology and Religious Education Department formally closed the program. This young man is the current director of the university’s ARCHers Network. Enjoying a bachelor’s degree in information systems, his imagination soars into heights when he works his craft out in object-oriented design and analysis. His creative vision is embodied in the production of technical plans with the application of his knowledge of design techniques. She is a proven social magnet and loves to play with kids and hangout friends. Her being creative in design, she makes sure that she struts with style and glamour in her modelling stints. She was reading the “Autobiography of a Yogi” by Paramhansa Yogananda, the Indian Swami who brought Yoga to the West, when something very deep in her was awakened - her desire to become a better human being and be connected with the Divine. She wanted to share this divine romance to the world so she decided to be a yoga instructor. Jayme has taken extensive teacher trainings in Yoga and ThetaHealing® where she was trained in hot, prenatal, post-natal, baby, toddler yoga and intuitive anatomy. Her classes provide holistic healing using a combination of modalities and nurture a connection of the body, mind and spirit. She obtained both her BS and MS in Physics at DLSU Manila and completed her PhD in Physics and Postdoctoral Fellowship at the University of Calgary in Canada, where she conducted a research on atmospheric aerosols in the Arctic region. Having grown up with dogs, she has experienced taking care of various types of dog breeds from Shih Tzus to Rottweilers, and Philippine native dogs. She has recently volunteered at the City of Calgary Animal Services to socialize cats and dogs at the animal shelter. Ofelia treats her dogs not just as pets, but as a part of her family and considers taking care of dogs an integral part of her life. As her name in Urdu suggests fragrance, Maria Pamela Zainab M. Javier appears to be a beautiful and colorful flower in the Islamic world. This Political Science graduate has worked with the Cultural Section at the Embassy of Islamic Republic of Iran and at the Bangsamoro Transition Commission under the Office of the President. As a scholar, her interests include women’s rights, peace movements, and Islamic religiosity. A global citizen back in her home country, the Philippines, after wandering around in the United States. Ireene is a marketing and advertising faculty at DLSU Manila. She is also an appointed Education Adviser for the US Embassy, Manila. Before Ireene pursued a non-profit track full-time, her most recent stint was with Nestle Philippines, where she was a Vice President for Marketing of the baby food category. Ireene worked in New York City for a couple of years as an Accounts Director for an advertising agency. She also resided in San Francisco Bay Area, where she held a Public Relations Executive post for The Filipino Channel. She studied for a master's degree at Georgetown University in Washington, D.C.
A registered chemist, an educator, and a nun who has been obedient to the truest call of her vocation for 43 years now. After being given assignments as Dean of College, as Superior-Directress, and as a High School Principal, she is now Department Laboratory Supervisor at St. Scholastica’s College Manilla College. She teaches psychology in the undergraduate and graduate programs at DLSU. She received her M.A. and PhD in Psychology from the Ateneo de Manila University. Her interest in the positive aspects of human development (agency of self, spirituality, creativity, narratives and meaning-making) is a running thread in her research and personal interests (poetry, literature, Buddhism, meditation, art, nature, dream work), and advocacy (vegetarian philosophy, environmentalism, mental health). She has been a vegetarian by choice for 24 years, and raised her a daughter to be a vegetarian from birth. A Buddhist by heart and by example, Venerable Miao Jing is a proven perfect epitome of the pleasant marriage of a profession and religion. She finished graduate courses in Buddhist Studies and Chemical Engineering both from the eastern and northern sides of this world over. Currently, she is the dean of the Fo Guang College, the director of Buddha’s Light International Association–Philippines, and the abbess of the Fo Guang Shan Mabuhay Temple. As part of its community engagement program, the Libraries adopts the Technical Education and Skills Development Authority (TESDA) Learning Resource Centers (LRCs) to provide training on basic library management and assist in the organization of library materials. 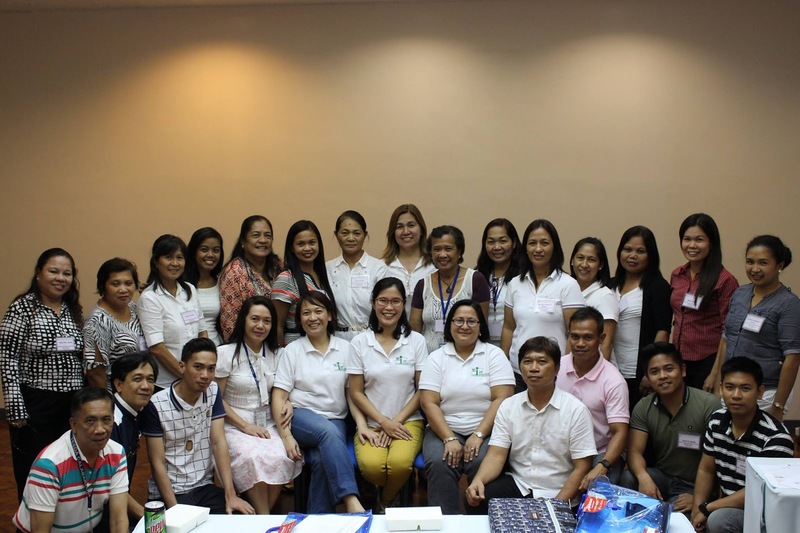 A one-day free training-workshop was conducted for the librarians and focal persons of TESDA held at the Central Office in Taguig on 28 June 2016. The training aims to help the participants to manage their LRCs and to assist them to standardize their library practices. A total of 29 librarians and focal persons attended the training-workshop. Ms. Elizabeth B. Padilla, Readers' Services Coordinator, discussed the circulation processes and facilitated the creation of standard library forms. Ms. Marian R. Eclevia, Assistant Director for Support Services, presented a practical guide to shelving and maintaining library collections. Finally, Ms. Karen Cecile V. Natividad, Technical Services Coordinator, gave a workshop on basic book repair and descriptive and subject cataloging. On 29 June 2016, the participants visited the Learning Commons to see the collections and facilities. The library tour aims to inspire the librarians and focal persons of TESDA LRCs to improve their spaces and services. A training session on library integrated system will also be scheduled to automate the information retrieval services.